Daily Menu contains Header, Footer, Date, Groups and Items. You can create only one Daily Menu, but unlimited* count of groups and items in this menu type. You can create menu link to this Daily Menu. Weekly Menu contains Header, Footer, Date From, Date To, Days, Groups and Items. You can create unlimited* count of days, groups and items in this menu type. You can create menu link to whole Weekly Menu (all days will be displayed) or to specific day only (day can be selected in Parameters Basic in menu link to Weekly Menu). Bill of Fare contains Header, Footer, Lists, Groups and Items. You can create unlimited* count of lists, groups and items in this menu type. You can create menu link to full Bill of Fare (all lists will be displayed) or to specific list (list can be selected in Parameters Basic in menu link to Bill of Fare). Beverage List contains Header, Footer, Lists, Groups and Items. You can create unlimited* count of lists, groups and items in this menu type. You can create menu link to full Beverage List (all lists will be displayed) or to specific list (list can be selected in Parameters Basic in menu link to Beverage List). Wine List contains Header, Footer, Lists, Groups and Items. You can create unlimited* count of lists, groups and items in this menu type. You can create menu link to full Wine List (all lists will be displayed) or to specific list (list can be selected in Parameters Basic in menu link to Wine List). 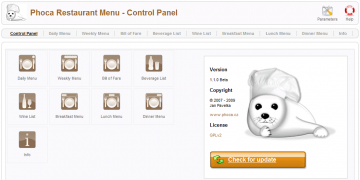 Breakfast Menu contains Header, Footer, Groups and Items. You can create only one Breakfast Menu, but unlimited* count of groups and items in this menu type. You can create menu link to this Breakfast Menu. Lunch Menu contains Header, Footer, Groups and Items. You can create only one Lunch Menu, but unlimited* count of groups and items in this menu type. You can create menu link to this Lunch Menu. 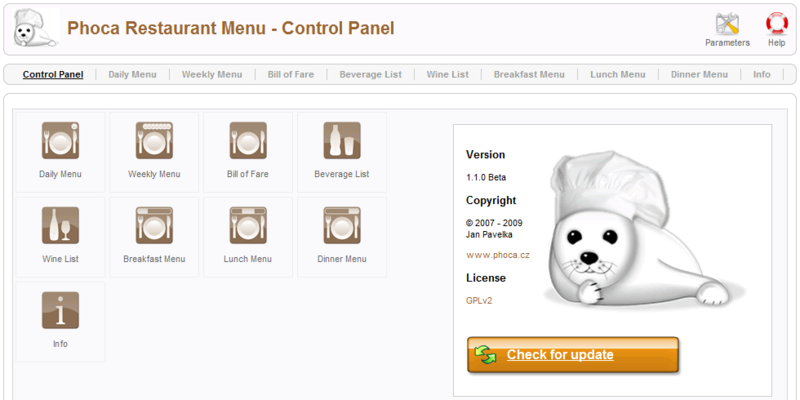 Dinner Menu contains Header, Footer, Groups and Items. You can create only one Dinner Menu, but unlimited* count of groups and items in this menu type. You can create menu link to this Dinner Menu. * Count of items (lists, days, groups, items) displayed on the site is limited by server performance and reasonable displaying of items on the site.